Undercover political policing and state surveillance. Meeting Monday 25 September, 7pm -9pm, Auditorium, Brighthelm Centre, North Road, Brighton BN1 1YD. All welcome including Labour Party delegates, The World Transformed attendees, labour movement activists in Brighton. Mark Thomas (comedian, activist, new book The Liar's Quartet). Chair Liz Davies (Haldane Society). The Haldane Society and COPS have been actively supporting labour movement, environmental, peace and other left-wing activists and organisations who discovered that they were infiltrated by under-cover police agents aka "SPYCOPS". More than 1,000 groups have been spied on by Britain’s political secret police, the Undercover Policing Inquiry confirmed in July 2017. This startling figure was first published in September 2016 in the second edition of Blacklisted: The Secret War Between Big Business and Union Activists. The new official confirmation came from the Inquiry in reply to questions asked by lawyers acting for around 200 significantly targeted people who have been granted core participant status at the Inquiry. The 1,000+ groups were targeted by undercover units, primarily the Special Demonstration Squad and the National Public Order Intelligence Unit, since the SDS was formed in 1968. 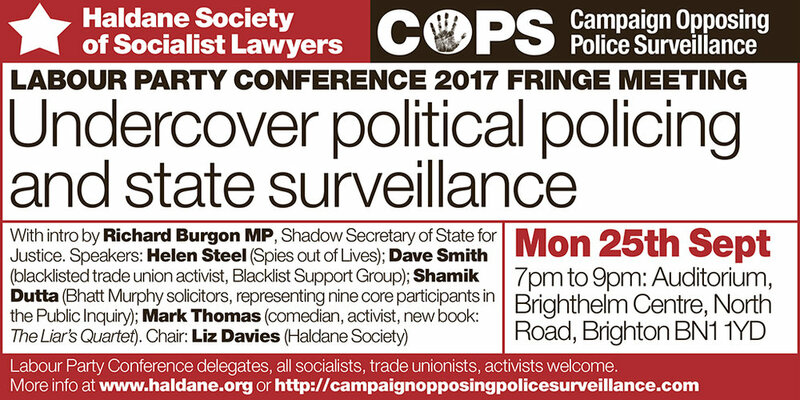 Our speakers Helen Steel, Dave Smith and Mark Thomas have direct experience of being spied upon. Helen Steel has accepted an apology and settlement from the police following its admission that her former partner was an undercover police officer. Dave Smith was a construction site worker, blacklisted for his trade union activities. His book "Blacklisted: the Secret War between big business and union activists" exposed the close connection between employers in the construction industry, the Consulting Association (which kept secret files on trade unionists and provided information to potential employers), and the police. Mark Thomas was spied upon and betrayed when he was active in the Campaign against the Arms Trade, by a close friend who was secretly working for British Aerospace. Solicitor Shamik Dutta is a partner at Bhatt Murphy solicitors, and represents nine core particpants in the Public Inquiry into Undercover Policing.